Last night was essentially the main event of the Winter Olympics: Women’s Figure Skating. This event has always had a kind of royal mystique to it. We get to know the profiles of the women involved, and there’s a soap opera to it. Remember the Nancy Kerrigan? Remember Tanya Harding? Kristi Yamaguchi? Michelle Kwan? Tara Lipinski? These skaters become National celebrities for a few weeks. Well, last night we were treated to yet another chapter. This year, the American’s had Rachel Flatt and Mirai Nagasu to root for. Very young, and not exactly very well known, but they were still our heroes for a night. With that said, those two gave great performances, but the U.S. failed to medal in the event for the first time since 1968. The Gold Medalist this year was South Korea’s Kim Yu-Na. She gave a beautiful, dazzling performance, and shattered the World Record — putting up an amazing 228.56 points. To top this off, this was South Korea’s only other medal in the Olympics other than speed skating. And it’s a great one to win. Congratulations to Kim Yu-Na! In the NBA, a much anticipated match-up between the Cleveland Cavaliers and Boston Celtics. This is possibly a preview of the Eastern Conference Finals, and it would be interesting to see how these two teams match-up as we approach the playoffs. Well, the Celtics came out strong, and got up to a big lead at the half. However, in the second half, it was ALL Cavs. It was like they were practicing out there. Headed into the half, the Cavs were down 8, and they won the game by 20. This team is truly dominant, and the addition of the Antawn Jamison only makes them stronger. Cleveland 108, Boston 88. Finally, some other interesting news out of the NBA. 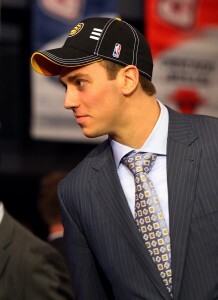 The Memphis Grizzlies had the #2 overall pick in this year’s draft. They took big man Hasheem Thabeet from UCONN over other strong rookies (i.e. Tyreke Evans and Stephen Curry — two rookie of the year candidates.). Now, they are sending Thabeet down to the D-League for a stint. He just hasn’t adjusted to the rigors of the NBA game, and they’re hoping some time spent developing his skills will prove valuable in case they need him to play some minutes in the playoffs. We will see how this pans out. Either way, Thabeet is the highest draft pick ever to be demoted to the D-League. In the Olympics, Lindsay Vonn was back in action in the Giant Slalom event. She was favored in the event (as she is the best skier in the world), but with her injury you never know. Well, unfortunately Vonn had a serious off day. With very bad weather in Whistler, Vonn spun out of control and crashed into the blue netting on the side of the course. Additionally, Vonn broke her pinkie in the process. It’s uncertain if she will be able to ski in her final event, but, needless to say, Vonn has experienced quite a bit of bad luck in these games. Elsewhere in Olympic news, the Canadians were shocked this weekend losing to the United States in hockey. It was a major setback, but they are still in the medal hunt — it’s just going to be tougher. To continue though, they needed to beat Russia. Remember, Russia is home to some of the best players in the NHL. If Crosby is the most dominant player in the NHL, Russia’s Alex Ovechkin isn’t far behind. And these two have a rivalry during the regular season with Crosby on Pittsburgh and Ovechkin on Washington D.C. With all that said, this game wasn’t even close. In just two periods of play, the Canadians put up an alarming 7 GOALS!!! And they wouldn’t need more than that. We could possibly see a rematch of United States & Canada for the Gold Medal. Now that would be a match to remember. Canada 7, Russia 3. Finally, in the NBA, the Dallas Mavericks have been hot lately, especially after acquiring both Caron Butler and Brendan Haywood from the Wizards. But… could they beat the Lakers? They would have to do it without Butler last night, who was out sick, but a win against LA is always good for a team’s self-esteem. Well, Kobe put on a show with 20 points, but the help that the Mavericks got off their bench was truly incredible. Jason Terry, winner of last year’s 6th man award, gave them 30 points as they hung out to defeat the defending champs. The Lakers have been struggling lately. Can we expect them to still be around in June? Dallas 101, LA Lakers 96. In the Olympics, it was a rough day for Bode Miller. Miller already has 3 skiing medals in this Olympic Games — a gold, a silver, and bronze, and he was hoping to do what nobody has done in a single Winter Games — win 4 skiing medals. However, he had a bad run after missing a gate in his first run. And as soon as you do that, you are essentially out of medal contention. This Saturday, Bode Miller will have one more chance to nab that 4th medal in the slalom event. Good luck to Bode. Kobe Bryant returned to action last night against the Memphis Grizzlies. The Lakers have been “ok” as of late, and have not played the dominating basketball their roster talent typically allows. They took on the rising Memphis Grizzlies (who could be trouble for a top team in the playoffs). The Grizzlies led most of the way, but you simply can not count out Kobe & Company. They rallied back, and with just under 5 seconds to play, the Lakers set up a beautiful play for Kobe at the 3-point line, and…. GOT IT!!! The Lakers won the game by a nose. Kobe finished the night with 32 points. LA Lakers 99, Memphis 98. Finally, out of the NFL, with LaDainian Tomlinson suddenly losing his job on Monday, another running back star was cut just one day later. 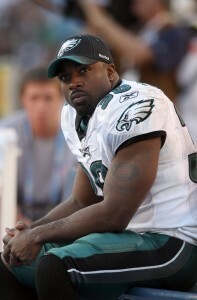 The Philadelphia Eagles have decided to release Brian Westbrook. Westbrook turns 31 this year, and has struggled with injuries the past few seasons. However, when Westbrook plays — he’s GREAT! Then again, they were committed to pay Westbrook $2.5 million if they kept him, and they thought that this was a time to finally let him go. The Eagles said that they hope Westbrook will be able to catch on with another team before the season starts. This makes way for 2nd-year running back LeSean McCoy to take the torch in Philly. The big news yesterday was out of the NFL. One of the best running backs of all-time has been cut by their team. 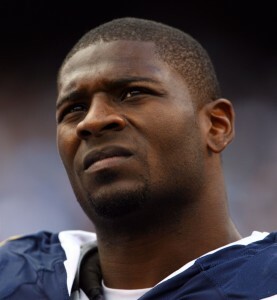 That’s right, yesterday the San Diego Chargers released running-back LaDainian Tomlinson. This isn’t exactly a “surprise” considering that Tomlinson’s performance has been rapidly declining. But to see a guy who put up amazing numbers for 9 seasons and was the heart and soul of the San Diego Chargers suddenly be out of a job is quite jarring. The bulk of the reason was that the Chargers needed to cut Tomlinson before a certain date or a huge salary requirement would kick in, and they just couldn’t afford that. Now the question is… which team will pick him up. He may not be a star any more, but he can still give you a great offensive option out there. And you know the Patriots love that. Elsewhere in the NFL, the Draft Combines are in action. That’s when the Pro Scouts get a good, up-close look at draft prospects. Tim Tebow, one of the greatest college players ever, was in attendance, but he has caught a lot of flack about his style. Apparently, most think Tebow simply won’t hack it in the NFL. 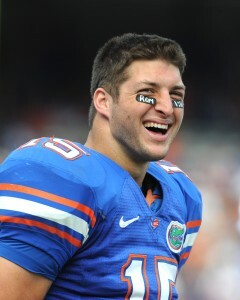 Well, Tebow has taken this to heart and has worked hard at literally changing his game. For example, he’s practicing day and night holding the ball up by his shoulder rather than his waist. He is determined to be a star in the NFL, even if the odds are against him, and that starts with doing whatever it takes. Finally, in the Olympics, a historical night. It was the always exciting ice dancing event, in what sounds like a soft event, but is actually a beautiful display of athleticism. Well, North America has never won a gold medal in this event, but they had some hopefuls there last night. And, when all was said and done, Canadians Tessa Virtue and Scott Moir gave a phenomenal performance and scored the first ever gold medal for the continent. It was truly amazing. In the Olympics yesterday, it was the much anticipated Hockey match-up between Team USA and the hometown: Team Canada. Canada was heavily favored in this game, and the entire city of Vancouver were extremely anxious to finally see it. Well, unfortunately for Canada, they wouldn’t have much to cheer about. The U.S. came out strong and outplayed the Canadians. And remember, Team Canada is home to the NHL’s best player — last year’s Stanley Cup MVP, Sidney Crosby. But it was Team USA’s Brian Rafalski who shined, putting in two goals on the night. Moreover, Team USA’s goalie, Ryan Miller (of the Buffalo Sabres), was a beast. He was truly magnificent with 42 saves on goal. It was his dominating protection that helped the U.S. oust Canada. The experts are calling this the biggest Winter Olympics Hockey upset since the “Miracle On Ice” in 1980 (when the supreme underdog Americans beat the Russians during the height of the Cold War). Congrats to Team USA. USA 5, Canada 3. Elsewhere in the Olympics, it was the return of Bode Miller. Four years ago, Bode Miller was the poster boy for America’s Olympics campaign. We were instructed to root for him at all costs. But… Miller had a bad-boy side, and turned off a lot of people. And with all that media attention on him in 2006, he failed nab the gold medal. Well, this time around, Miller has been under the radar. And because of this, he was able to focus on what he does best — skiing. He finally grabbed gold in Sunday’s super-combine event. And in the NBA, the Cavs are easily the hottest team in the NBA right now. And they are doing everything they can to keep LeBron as happy as possible because they want him around next season. With several teams making cap room for him in the past few days, it’s imperative that Cleveland Cavaliers WIN this year, and hopefully convince him to stay. 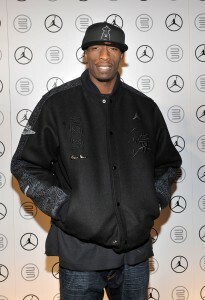 So, they granted LeBron’s wish, and brought the Wizards’ Antawn Jamison to town. However, he was 0-12 in his debut, and currently the Cavs are on a two-game losing skid. So they needed to make the most of their game against Orlando. This game also saw the match-up of the original Superman (Shaq) and the new Superman (Dwight Howard). Who would be the victor? Well, Shaq had the edge early, but Dwight Howard took over later in the second half. He finished the game with 22 points and 16 rebounds. The Cavs led most of the way, but the Magic would rally for the win. The Cavs are still the team to beat, but they’ve lost 3 in a row. Orlando 101, Cleveland 95. Last night in the Olympics, it was men’s figure skating. The favorite was the Russian: Evgeni Plushenko. He came out of retirement attempting to make history and win a second straight gold medal. However, the U.S. was hoping that their own Evan Lysacek could take the prize. Well, it was very VERY close, and Plushenko gave an amazing performance, even celebrating at the end suggesting “Yep, I did it”. 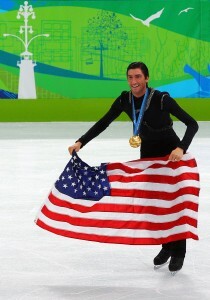 But… he was wrong, as the final scores indicated that the United States’ Evan Lysacek had in fact won the gold. This came as a major upset, and also makes Lysacek the first U.S. men’s skater to win the gold since Brian Boitano in 1988. Congrats to Evan!!! And in women’s skiing, Lindsy Vonn was hoping to win yet another gold medal. Prior to the Olympics, Vonn was injured, but she did surprise everyone by winning a Gold on Wednesday. Well, yesterday didn’t yield such positive results. Just about 20 seconds from the finish line,Vonn’s right ski was got on one of the slalom gates and she fell. Many thought this was due to her injury, but her coach thinks it was just aggressive skiing. However, Vonn said her ankle is killing her right now. Vonn still has another event coming up on Saturday, and hopefully she will have a chance to rest up, heal, and give it her best. And in the NBA, there was yet another major 3-team deal. The Rockets sent Tracy McGrady to New York. Essentially, McGrady is a salary dump, and the Knicks will probably get rid of him during the summer. Knicks rookie Jordan Hill and Jared Jeffries will head to Houston. Meanwhile, the Rockets also acquired the Kings Kevin Martin (a secretly great player). The Kings will receive Carl Landry from the Rockets and Larry Hughes from the Knicks. This trade was all about shedding money for the Knicks. They are going to make a serious push for LeBron James in the off-season (and maybe Dwayne Wade), and they need all the money they can get. The Rockets however have now reloaded and have a very exciting team. Their General Manager is quite a crafty guy, and if they get Yao Ming back, they will definitely be super competitive in the West next year. WATERCOOLER CHAT: VONN, DAVIS AND WHITE WIN GOLD!!!! It was Day 6 of the Olympics, and we would finally find out if the American favorite, Lindsey Vonn, would participate in the women’s downhill skiing event. Vonn suffered an ankle injury just before the start of the Olympics, and it was unclear if she would be able to compete. Vonn was doing everything she could to palliate the pain — including applying cheese to the swollen area (hey, you’ll try anything when you’re desperate). However, at the last minute, Vonn was at the starting gates, and when they opened, Vonn showed absolutely NO signs of injury. It wasn’t her most elegant run, but she finished with a time of 1.44.19, and that was enough to finish first and take home the gold. What an amazing comeback story. Congratulations to Lindsey Vonn!!!! Will she get another Cow? See Today Show trivia above. 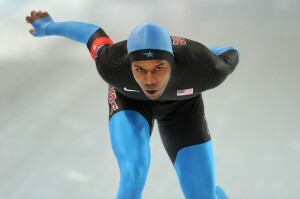 And in Men’s Speed Skating, the favorite was the United States’ Shani Davis. Four years ago, Davis became the first African American to win a speed skating event. But this year he would face very tough competition in South Korea’s Mo Tae-bum. Would he take the Gold again? The answer: Yes. Davis was electrifying, and took home the gold. He is now only the fourth American male to win more than one Gold medal in speed skating. Truly amazing. Congrats to Shani Davis. Finally, in the Day’s Main Event, America’s Shaun White took to the snowboarding half-pipe. White was probably the most favored to win for the U.S. in the entire Olympics. He truly dominates this sport, and is the marquee face of snowboarding throughout the world. Well, White didn’t just go the Olympics to win, he wanted to put on an unforgettable show. And that he did. White finished with two near perfect scores in his two appearances, and easily won the gold. However, even more notable, White performed the trick he had been preparing for months. It’s called the “Double McTwist 1260” — a very dangerous trick that’s truly dazzling to watch. In fact, White didn’t even to do this to win, he just wanted to put on the greatest show of the Olympics and prove, once again, that he owns the sport. In the NBA, with the trade deadline just 48 hours away, we can expect to see some major action. We’ve already seen the 7-player trade between the Wizards and the Mavericks. The Wizards shipped out three “problem” players in Caron Butler, Brendan Heywood, and DeShawn Stevenson, and in return they got former all-star Josh Howard, Drew Gooden, Quinton Ross, and James Singleton. This gives the Mavs some great pieces to compete in the playoffs, and the Wizards get a fresh look and shed a ton of cap space. They are going to be the new look Wizards, and will definitely try to land a major player in the off-season. Elsewhere, the LA Clippers have parted ways with Marcus Camby sending him to the TrailBlazers. The Blazers were looking for a middle piece to replace the loss of Greg Oden and Joel Pryzbilla for the season. In return, the Clippers got point guard Steve Blake and forward Travis Outlaw. For the Clippers, this was more of a salary move, and they are getting ready for next season. In the winter, the Clips will have their #1 pick Blake Griffin back, and could also land a major player in the biggest free agent summer ever. Elsewhere in the NBA, some sad news. It looks like Denver Nuggets head coach, George Karl, has been diagnosed with throat cancer. This is not the first time that Karl has had to fight cancer. He had prostate cancer in 2005. Karl says he wants to keep coaching the Nuggets as long as possible while fighting the cancer with radiation and chemo therapy. It was All-Star weekend in the NBA. This year the game was in the new, magnificent Dallas Cowboy stadium. They had a whopping record capacity for an NBA All-Star game at 108,000 people. Many people don’t realize just how huge an event All-Star Weekend is. It doesn’t draw as many as the Super Bowl, but it squashes other major sports All-Star events. Saturday night was the always thrilling slam dunk contest. Participants included Toronto’s DeMar DeRozen, the Lakers’ Shannon Brown, Charlotte’s Gerald Wallace, and the defending champion from the NY Knicks — Nate Robinson. Typically, this is the event that electrifies the crowd. But, this year, it was rather lackluster. The first round saw very uncreative dunks, with the only reasonable highlights coming from the rookie DeRozen and last year’s champion Nate Robinson (who stands all of 5’6, so any dunk he does is pretty special). Well, in the second round DeRozen had a nice dunk off an alley-oop pass off the side of the backboard, but Robinson stole the show once again. He started off hanging out with Dallas Cowboy cheerleaders, then threw an alley-oop to himself off the backboard and finished with a reverse jam. And, once again, Robinson is the slam dunk champ. That’s his 3rd victory. Can we expect him next year? And Sunday night marked the main event. East v. West, in the most exciting exhibition game in all of sports. Sure, the players don’t exactly play “good” defense, but they sure do put on an offensive show. While the game was close, most of the highlights came from the East. LeBron James and Dwayne Wade were dunking and alley-ooping out of their minds. The West, on the other hand, were without their marquee player: Kobe Bryant. Towards the end, Chauncey Billups put up a key shot to tie game, but when the buzzer sounded, the East had a 2 point lead and took the bragging rights. Dwayne Wade finished the night with 28 points and 11 assists and was named All-Star MVP. Finally, there’s a little drama between Orlando’s Dwight Howard and Cleveland’s Shaquille O’Neal. What’s the controversy? Their nickname: Superman. They, um, both have it. In a contest last week, the Cavs beat the Magic, and Shaq said, “You tell me who the real Superman is”. Howard was offended by this, and said he wished Shaq would have been supportive of him and realized that Howard is just trying to get to the superstar status of Shaq. Instead, Shaq put him down. Howard said he’s just trying to have fun out there and do his own thing — not try to be Shaq. Most likely, this heat will go nowhere, but the NBA’s melodrama is unpredictable. In some unfortunate Winter Olympics news, it looks like United States Golden Girl Skier, Lindsey Vonn, might miss the Olympics. She was expected to bring home the gold metal for the U.S., but a shin injury could keep her out of the games completely. This comes as horrible news with the big event right around the corner. It’s not official yet, but the injury looks pretty bad. We’ll keep you posted on her progress. In hockey, the Washington Capitals were hoping to extend their amazing win streak to 15 games. This is the 3rd longest win streak EVER in the NHL. But… they would need to beat a decent Montreal Canadian team to do this. Their streak is due to their amazing offensive play, led by the supreme Alex Ovechkin. However, last night, Ovechkin wasn’t the dominant player, it was Brooks Laich. He had a Hat Trick, meaning he scored 3 goals in the game. A very difficult feat. But, the game went to overtime, and the Canadians’ Tomas Plekanec put in the winning goal with just under 5 minutes to play. And with that, the Capitals incredible win streak came to an end. Montreal 6, Washington 5. In college basketball, it was the annual Duke / North Carolina showdown. Before the game, Tyler Hansbrough, the UNC great, had his jersey retired. UNC has had a lackluster season, losing its last 3 games. In fact, they’re un-ranked. Well, North Carolina gave Duke a run for their money, but in the second half Duke got their shooting touch back and wound up on top. Jon Scheyer led the way for Duke with 24 points. Next up for Duke… the other top team in the ACC, Maryland. Now that will be a match up. UNC, on the other hand, can only hope for a bubble birth for the March Madness tournament. This is simply not their season. However, the Tar Heels do have the #1 recruit in the country, Harrison Barnes, joining the squad next season. Duke 64, UNC 54.